I am 100% addicted to Steem Monsters. The problem is not the addiction (I have many), the problem is I am going to lose my job as I am doing nothing else but playing. However, there is a fantastic solution. Very soon @steemmonsters will allow the delegation of cards. Practically, this means ANYBODY can get an opportunity to play at the top with fully maxed out card sets etc. Are you my saviour and the new Steem monsters champion? If you like playing and you’re good, I am giving you the opportunity of a life time, I will delegate my maxed out card set to you and we just split the profits. I am a very dedicated winner in everything I do and I will share with you all the strategies and secrets to win many tournaments and become a top 10 player. If you don’t have a clue what kind of money we are talking, just look at the price pool of the tournaments. If you are young and smart and living in an Asian country, you could become the first pro game player in the world. Every 2 weeks there is a new season, rank number one is good for a 100! Bonus packs and you can get loads of reward cards too when you are playing in the highest league. Impossible? Not at all! The secret is time, patience and off course good game play. My only problem with this action is finding the right candidate. I think the 2 most important things needed are time and that extra thing. That extra thing is knowing exactly which 2 teams are strongest in each type/manna game (that’s easy) and feeling your opponent, what will he/she play, is it a creative player or a copy-paste player etc? If you are interested, let me know in the comments and we can talk further in private through discord or something. If you think automatic tournaments was the biggest thing coming to Steemmonsters, think again, delegation will change everything (again)! The creators of Steemmonsters are true creators, the game is bound to succeed big time. I discovered @yabapmat on Steem before he was programming for Steem, he is a super talented programmer and I am so glad he took the leap towards Steem. I met @aggroed on my first SteemFest this year, he is the perfect complimentary companion to @yabapmat, he knows how to get things done and has all the insights needed to get wherever he wants to get. Get in there! It’s all about the ‘who’ behind the curtains! I would love to be your "player" and take your Max Deck thru all the high rolling tournaments and season rewards. But I got the same problem as you, a leck of time and energy. I grinded my own Account up into Champions league and I know how hard it is when you are playing against higher decks than yours. If I would be "new" to Steemmonsters and I enjoyed the gameplay so far I would definitly take this chance to play the maxed Deck. But yeah, I already exhausted myself financially and time wise with Steemmonsters. I probably won't keep up the same amount of time and energy to stay on top with every season and since my Deck is almost maxed out as well. I probably would look also for somebody to play my Deck. I'm curious how the delegation market will develop and if there is demand for our Decks. Good luck and fun everybody! I think I could be a good candidate to work with you. We'd have to agree on a split, but I've got a pretty good track record of dominating the competition until the new legendary summoners costed me out of relevance. 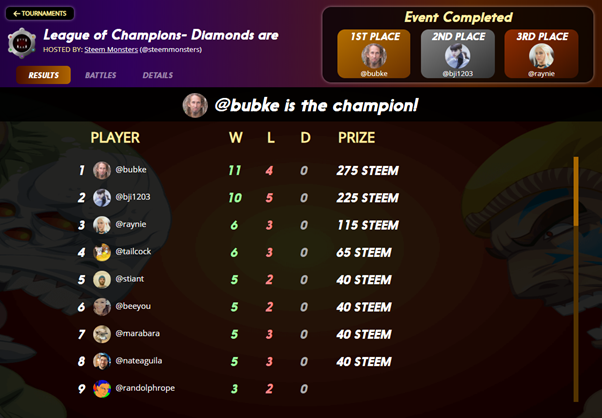 I spend my time helping out in several STEEM based communities and doing odd an end jobs online and I've trained a few other successful tournament goers. wow, that's great, i know you're a master of the game. Out of relevance is the perfect description for maxing out the new summoners but i already spent so much on the game that it was also a no-brainer to get them. I definitely want to work with you, let's wait for the arrival of the feature and continue on discord or other pm. Would you be only interested in the new summoners or the whole deck? We can discuss it more on Discord, but my current plans are to hang on to my alpha cards and I have a few here and there that I never maxed, so I suppose for all intents and purposes I'd want to work out a deal for the full deck. I was thinking the same thing - I don't have time to play a lot and wanted to delegate my deck. Good luck with finding a player - maybe I will try to find my own one soon as well. Hello, I've sold/given some of the cards so I do not have a complete set of deck copy. Still, if there are some specific cards you would like to use, let me know. I will be playing his maxed deck. I'm pretty sure you'll find someone to play. Thanks for the resteem! What is Team possible? Is it SM dedicated? Yep. It's a small group of SM players. TP was set up by @davemccoy and @cryptkeepr17 - we're just a happy bunch of players chatting away on Discord and sharing some tips and ideas. I might be interested in playing a max level deck for you or someone else depending on the terms. I do have some maxed level cards myself but not enough to be competitive at the highest levels. I have an extra account which I could use for such a delegation. All play on it would be using the delegated cards so all profits won would be easily tracked. Yeah, everyone at all levels are trying for that little extra push at the end of the season. Good luck with regaining the 1st position. However, the offer is so good I'm sure you'll find help. If you find one I have a bunch of cards too and I'm not playing. What's a bunch? :-) It will be easy to find people, that's why it is such a game changer, you can be passive investor now. Did you buy +500 packs? I have over 2k cards. My username is the same as here on steemit. This is a long shot, because the post is already 2 weeks old, but I thought it wouldn't hurt to ask. Did you find someone yet? Haven't heard back from jrvacation yet, so I'm assuming the deal won't go through. So I'm still looking for a chance to test the limits of my skills instead of the limits of my deck. it is difficult to let go of an addiction :-) I let somebody else play for a few days and that didn't work out, i am playing myself again for now trying to stay top 10 with the least amount of time. i will finish this season off myself and then see, clayboy would be my preferred candidate if i delegate. much love. I understand. Clayboyn is a great player (one of the few I have only been able to beat in one battle, lol) and he is used to playing higher level cards. That's why I added that remark to my previous comment. I'm used to playing level 6 (rare summoner), level 5 (epic summoner). I've been doing some research and got confronted with the fact that the strength of the cards differs when played at maxed level. This means I would have to change all the strategies I've been tweaking for weeks to get them to work, lol. Is there already the option of delegating cards or is this a personal test? You should have started playing with SM instead of Drugwars because the gameplay and development of SM is far ahead of Drugwars. This is a real competitive card game where you take ownership of your cards and proof yourself in Battles and get rewarded for it. Steemmonsters is the gold standard for blockchain games here on Steem and probably a cross many plattforms.